How to engage participants and manage trial activities in group-based settings like support groups, fitness classes, and information sessions? Most clinical trial engagement tools support two participant engagement models: traditional one-on-one study visits and digitally enabled virtual trials. ProofPilot’s group-based participant engagement features fills the gap. For those who follow ProofPilot, you know of our interest in promoting good nutrition across various population groups. 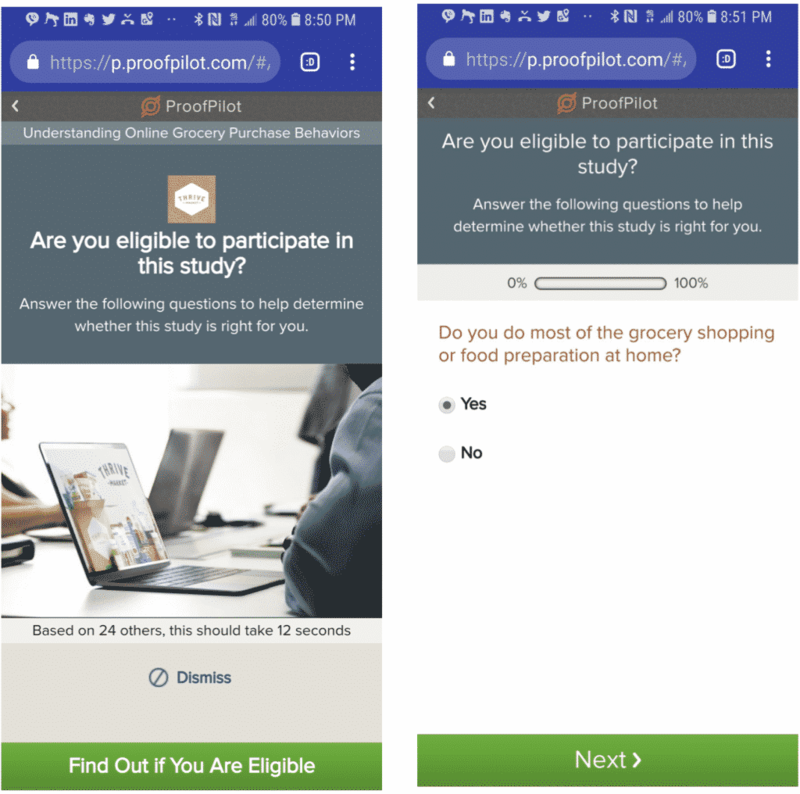 Recently, we started a pilot study with the University of Florida (which runs many USDA nutrition education programs) and Thrivemarket.com. Nutrition education for low-income individuals is funded through state and county grants by the USDA. Most of these classes are pop-ups. Meaning that nutrition outreach workers go into the community and set up classes in churches, food pantries, community centers and other central locations. It would be disruptive to individually enroll and ask questions of as many as 30 class participants as part of an evaluation. Instead, prior to class, they access a special ProofPilot group SMS code and number for that class. They post that number and code for all in the class to see. Participants send the code to a special ProofPilot number and it records thier attendance at the group activity. As part of a pilot program with the University of Florida and Thrivemarket, participants use this code to register attendance at a class. If the participant isn’t already a participant, this is an ideal opportunity to recruit the potential participant. A click on the provided link will immediately take the user to the study recruitment page on ProofPilot for that study. There are no downloads required. No special technical skills. The group instructors and organizers are not bothered. 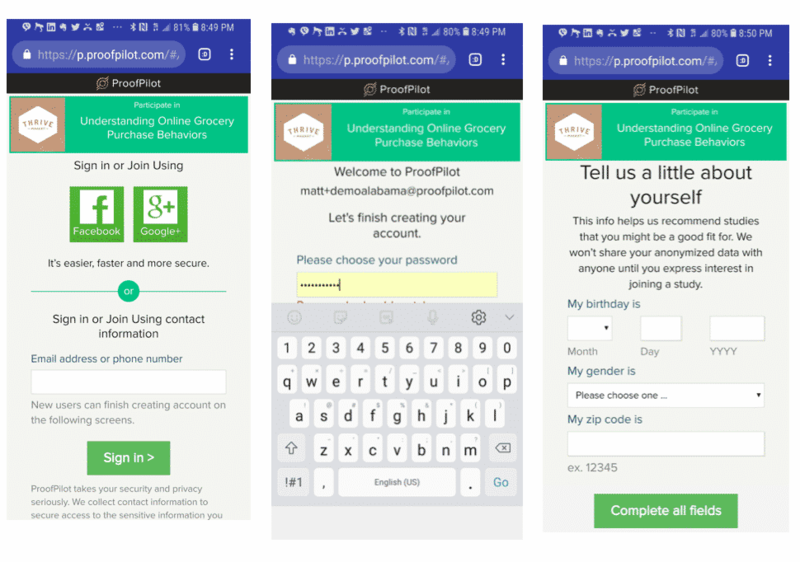 ProofPilot then walks the participant through a consumer-grade registration process. Most Americans, even at low income and education levels have signed up for a music service or ordered from Amazon. The ProofPilot registration experience feel familiar. Following registration to ProofPilot, the system will issue the next study tasks based on your protocol design. In this case a basic eligibility screener survey task. Each task starts with an introduction and then continues to the task itself. The next task in many study designs is the informed consent. Participants review the consent and accept. While they may ask questions of the program administrators, the process remains far more efficient than traditional person by person processes. Once the participant accepts consent they are an official member of the study. 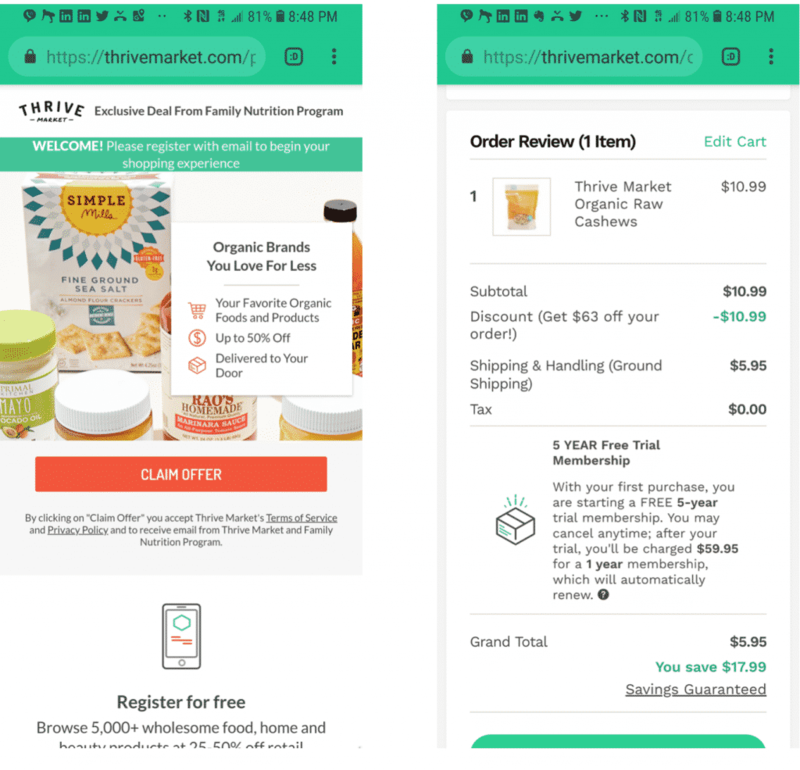 In this study design, grocery credit rewards from Thrivemarket.com trigger after each class attendance. ProofPilot recorded this participants attendance. Therefore, the grocery credit is immediately available to the participant. 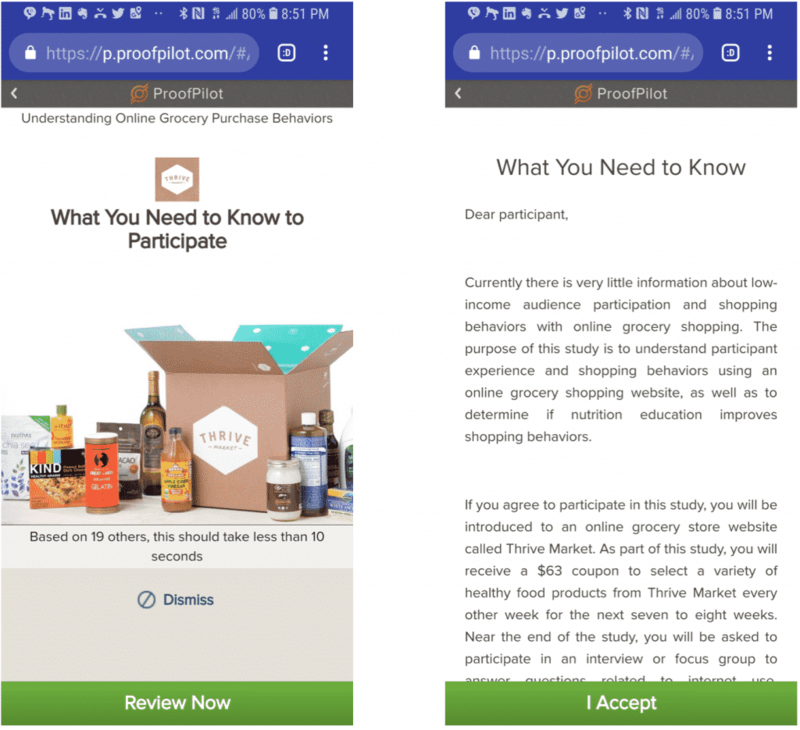 ProofPilot sends notification of the reward to the participant by push notification, SMS, or e-mail, depending on the participant’s communication preferences. This is standard ProofPilot promotion code functionality and can be used to link external data collection, help users download apps, and fulfill interventional products. They don’t have to use the reward immediately. It’s saved in the ProofPilot wallet. When they are ready, they can click to redeem. ProofPilot automatically appends the promotion code to the users session at Thrivemarket.com. The user orders groceries and gets the $63 credit. Almost all ProofPilot studies are longitudinal. Once the user is part of the study, each group task confirmation SMS triggers follow-up tasks based on the study design. The example study here includes 8 classes over the same number of weeks. Grocery credits trigger at some of those classes but not all. ProofPilot is very excited about our support for group based study activities. We believe real world data comes from real world activities and environments. And a lot of those activities include a group of participants.